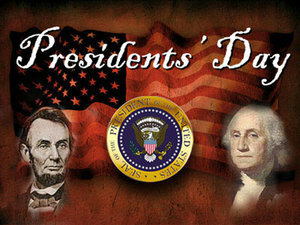 Presidents' Day is one of the popular holiday of United States. It is always celebrated on the Third Monday of February. President Day is celebrated in the memory of the first president of United States of America, George Washington. It is a federal holiday in USA and celebrated on the third Monday of the February. It is also the birthday of George Washington, the first president of USA but commonly known as presidents' day. It is an occasion to remember all the presidents, not just the George Washington. This day is also a state holiday in most of the states with official names including Presidents' Day Washington and Lincoln birthday. It is celebrated in the memory of the first president of United States, George Washington. He was elected president of United States two times. The first term was 1789 to 1793 and the second term was 1793 to 1797. Before getting the position of president, he played important role in military. He led the American Continental Army to victory over the British in 1783. He is also known as the father of United States and probably the best known American politician ever. The capital of United States Washington D.C. is named after him. One dollar bill and quarter dollar coin also contain his image. President's day is an official birthday of George Washington, the first president of United States. This day commemorate all the past presidents of the USA. It is celebrated in almost every state. Schools often organize events and programs for students about the presidents of United States. It is a very popular day for stores to start their sales. It is celebrated every year on the third Monday of February while record shows the George Washington birthday on 22 February. It is a federal holiday in USA. Although it is a federal holiday in USA but many businesses are open as usual. Many stores hold sales on Washington birthday. Some schools are closed for the whole week for a mid-winter recess. When is Presidents' Day in 2024? When is Presidents' Day in 2025? When is Presidents' Day in 2026? When is Presidents' Day in 2027? When is Presidents' Day in 2028? When is Presidents' Day in 2029? When is Presidents' Day in 2030?